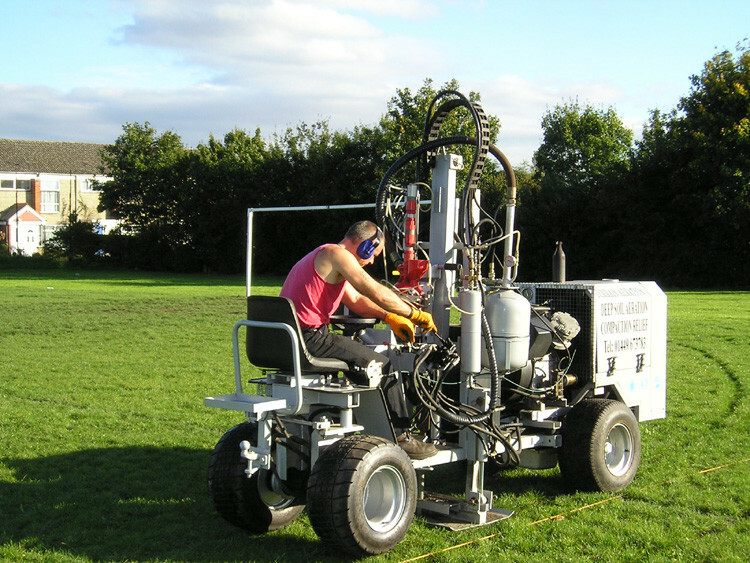 Terrain Aeration is taking part in a first time comparison study of three different methods of aeration, mounted by Dudley Metropolitan Borough Council. Russell Norton, Technical Manager of the Green Care Section, (part of the Directorate of Urban Environment Management Division) says that they are concerned about the drainage on some of their football pitches within the borough. "All our pitches tend to be constructed on old mining sites," he explains. "At Dudley Wood Playing Fields we have three pitches which are all played on to the same extent and have the same subsoil of predominantly pit spoil and clay. They all suffer from poor drainage due to compaction and hard pan, and the summer drought hasn't helped. Any water we get just lies on the surface. This seemed the ideal opportunity to compare three different aeration methods. We invited Terrain Aeration to treat one pitch with their Terralift machinery, and A.L.S. to treat another with their Rotodrain and the third with their verti-drain." Terrain Aeration's Steve Oates arrived on site at the end of October with the company's Airforce Terralift machine and injected compressed air, one metre down on a staggered grid pattern of two metre spacings. Dried, milled seaweed was injected on the final air blast, which will swell on contact with moisture, keeping the newly created fractures and fissures open. "About 15 to 18 inches down the ground was very hard and I needed the hydraulic hammer to insert the probe the whole time," Oates remembers. "I inserted the air at virtually full pressure, 20 Bar throughout the sub soil, before the ground staff filled the probe holes with Lytag." Four weeks later the other two pitches were treated, by A.L.S., and members of the Stourbridge and District Football Leagues will assess the success of the three different aeration methods throughout the playing season. "Their conclusions will influence how we treat our pitches in the future," comments Russell Norton.